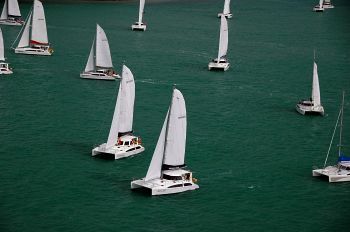 A total of 17 Seawind catamarans and 80 crew attended the 2nd biannual Seawind Whitsunday Rally held from June 7-14, racing from one island to the next throughout the beautiful Whitsunday Island group. 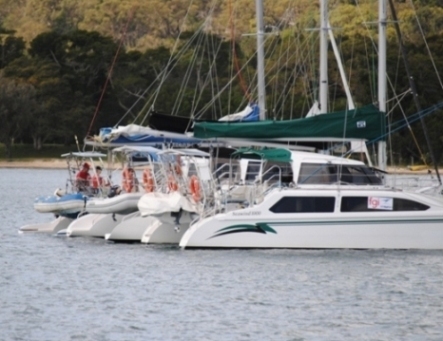 As the longest event on the Seawind Cruising Club Series calendar, the Whitsunday Rally is beginning to gain legendary status among Seawind owners around the world with a 40% increase in attendance from the initial rally held in 2006. Though many crews delivered their boats to the Whitsundays from ports along the east coast of Australia including as far south as Sydney, other crews flew in and chartered Seawinds from various local charter fleets in Airlie Beach and Shute Harbour, including a crew from Perth, a family from New Zealand and a crew from California, USA. The rally took the flotilla of Seawind catamarans from Whitsunday Rent A Yacht’s base in Shute Harbour, to Long Island resort where the crew enjoyed a Hawaiian themed beach party. The next day started with a dinghy beach start racing to Hamilton Island for a 3 course dinner at Romano’s Italian restaurant. Then the fleet raced Shaw Island to the south where the Blind Man’s Dinghy race was held and the north again to the famous Whitehaven Beach for a beach BBQ with Whitsunday Private Yacht Charters. This was followed by a race to Butterfly Bay on Hook Island, and finally back to South Molle Island for presentation, live entertainment and seafood buffet. 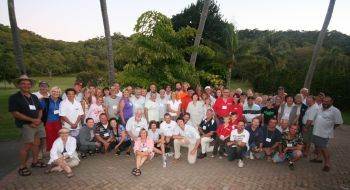 The Whitsunday Rally is just one of seven regattas and rallies hosted by Seawind as part of the 2008 Seawind Cruising Club Series which will see around 100 Seawinds and 500 crew participate throughout the year in Australia and the USA. This initiative is aimed at encouraging owners to meet one another, share ideas & knowledge and sail in company and has proved a huge success. Sponsors: FGI, Whitsunday Rent A Yacht, Whitsunday Private Yacht Charters, GME, Finlease, Tempo Spars, Yanmar, UK Halsey & Harken.